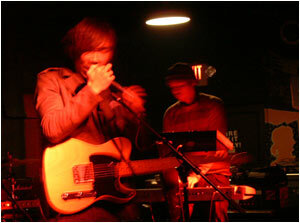 Plus there is the fact that Cassavetes play with interesting bands. For example, last time i went to see The Nein and Cassavetes were opening, while this time i was going to see the new lineup of Sleep Therapy, and Cassavetes happened to be headlining. So, really -- i am not stalking these people. It's just a coincidence! Okay, i am spending too much time thinking about that, so let's just move on. First opener Go Motion went on shortly after i arrived at Lenny's around 9:30. This is a 5-piece band including 2 Asian kids. Not that unusual to see Asians in a band (well, actually it is, but i digress), however it is unusual to think about ethnic folks in Omaha, Nebraska, where the band are from. Now, i have to admit that i know nothing about Nebraska other than that they grow a lot of corn there, and it is one of the square states in the middle of the country. One has the impression that these states are all full of Bible-thumping white folks, and seeing these 2 Asian kids introduce themselves as being from Nebraska threw me for a loop.... But again, i digress. Go Motion -- Asian-Nebraskans in post-punk action. 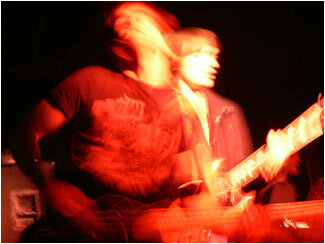 Go Motion are a 5-piece band firmly entrenched in the modern New Wave revivalist movement. These kids have listened to Interpol, The Futureheads, and I Love You But I've Chosen Darkness, and have probably even gone back and listened to some of the influences (The Cure, Joy Division, U2, etc.) of those bands. They do a fine job of it, to be honest. 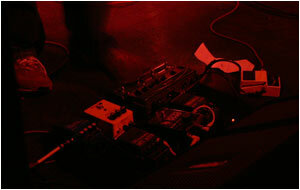 The guitarist plays with a lot of pedals, and he makes a righteous noise. The keyboard is relatively prominent in the mix, and the drummer plays a dancey-sort of beat, which made me think of The Faint, although i could be subconsciously lumping Omaha bands into one category. In general, i would say they are more I Love You But I've Chosen Darkness and less Interpol; that is, they are more into the subtle groove than the mopey lyric. I would actually compare them to Cactus World News, a relatively obscure 80s Irish band that i remember getting a lot of airplay in 1986 on Album 88. [Brendan's Note: They must not be that obscure because they have a fan site!] So -- if you remember then, Go Motion are kind of reminiscent. In general, they played a short set of catchy New Wavish rock, and i enjoyed it. 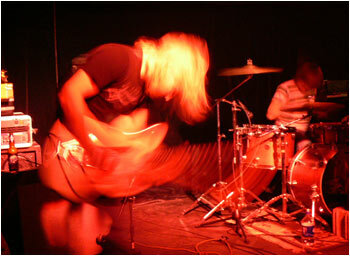 Go Motion -- thrashing it up, years later. Sleep Therapy was up next. I haven't seen them in about a year, and the last time i was stalking Cassavetes -- i mean, seeing Cassavetes at Lenny's, i ran into Sleep Therapy vocalist John Lally. He informed me that his band still existed and that they had been absent for so long because they had to change out guitarists. 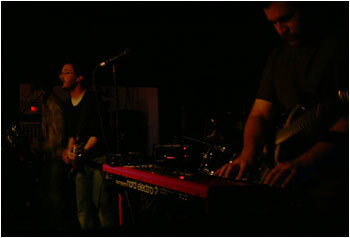 This show was their debut with new guitarist David Pogge. This was, in fact, the reason i came out this evening. Sleep Therapy's David Pogge in action. Well, truth be told, Pogge did a fine job. Sleep Therapy played a set of about half new material and half old songs. The old stuff sounded great and not that different from what i remember, and the new material written with Pogge on lead guitarist is not a radical departure for the band. They still make epic rock music that is not too fast or energetic, and has a heavy emphasis on vocals. A good set. I am glad to see them "back in the game". 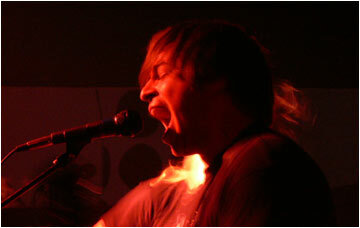 Sleep Therapy's John Lally in mid-scream. Cassavetes took the stage at 11:30, a mere two hours after i showed up. How is it that Lenny's moves in such a timely fashion, and how can i get The EARL to learn from this? Well, i spent most of the Cassavetes show talking with Mr. Lally. Again i find that Cassavetes played a good set of dark, Myssouri-influenced music. A couple of the tunes they played had a certain spaciness to them that was almost Pink Floyd or Spaceman 3-like. I found them rather enjoyable. Cassavetes play in the dark. On the whole, not a bad night out. I like this shot. That's David Pogge pedaling!